Posted on Thu, Jan 19, 2012 : 6:08 a.m.
Gov. Rick Snyder used his second State of the State address to defend the state's emergency manager law, which was the subject of protests near his home this week. He argued the law, amended under his watch to expand the powers of state-appointed emergency managers, is helping communities deal with their financial problems. "A number of our cities and schools are suffering major financial distress," he said. "This problem is not a new one, but it's an important topic we should fully address in 2012." Michigan Governor Rick Snyder walks into the House floor to applause to deliver the State of the State address Wednesday night. When he came into office, Snyder said, the state had six cities or school districts under emergency financial management. Last year, one more joined the list and it appears Detroit could be next. The overriding common feature among communities with an emergency manger, Snyder said, is they've lost population without a corresponding right-sizing of their cost structure. "Tonight, I want any jurisdiction that's struggling with its finances to know we are committed at the state level to be a supportive partner to help you resolve your challenges," Snyder said, turning to recognize Detroit Mayor Dave Bing after making that remark. The long-term answer is not simply about cutting costs, Snyder said, but how to create a financially solid foundation so that growth can occur again. "Detroit has many exciting developments going on, and resolving the city's financial challenges would clear a path to a bright future," he said. Snyder explained the use of an emergency manager is intended to quickly and effectively solve financial problems so a community can get back on a positive path. "Some people may wonder what we're talking about when the term 'financial emergency' is used," he said. "Think about a situation where employees are not going to get their paychecks, suppliers are not getting paid, bond payments are being missed, or financial statements cannot be completed. These are critical problems." 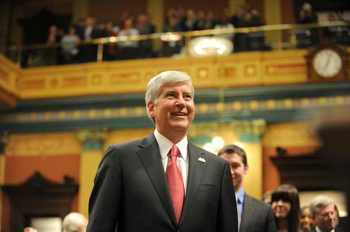 Snyder also promised Wednesday night to continue to work on regulatory reinvention in 2012 by continuing to rescinded obsolete, confusing and burdensome regulations. "This year we're going to continue our regulatory reinvention by eliminating rules that simply don't make sense," he said, sharing three examples that drew laughs from the crowd. "First, we have a rule mandating the size of a barber's wastebasket and how many times it must be emptied. I just got a haircut and my barber wasn't aware of this particular rule. but the Department of Environmental Quality has 28 separate requirements for outhouses, including a requirement that the seat not be left up. I don't know about you, but I have a higher authority at home. I don't need the state telling me that." Mon, Jul 23, 2012 : 6:11 p.m.
Perhaps a name change is in order to go with our newfound backwardness. Michissippi? How about Michiesiana? Michalachia? Michkansas? On the other hand, we would have to be a lot more progressive and forward thinking to deserve any of those monikers. How about some of our politicians take a pay cut????? instead of cutting education and emergency services finding... any answers there??? Fri, Jan 20, 2012 : 6:42 a.m. I would ask those of you who support this law to consider carefully. Rhode Island had a court-appointed manager take over a town. The intention was that he would manage finances, but he has tried to make decisions effecting the lives of the citizens of this town AND those who visit (for those who think it might not effect them ever). Perhaps take away the power of elected officials to make fiscal decisions in a time-defined emergency. PERHAPS. But REMOVE the elected officials who were voted in by the people most directly helped or harmed by the decisions made? Never! Not in a democratic country. Fri, Jan 20, 2012 : 4:53 a.m. Sat, Jan 21, 2012 : 7:25 p.m.
Somargie, the tax breaks went to small businesses that were being 'double' taxed on their businesses and their income...no union would agree to that. Regarding those &quot;for profit&quot; charter schools.......public schools have 85% of revenue going to employees with 30% of revenue targeted for retirement health care costs alone....I consider those kind of benefits to be quite profitable. Your beef seems to be that you resent others intruding upon your perceived entitlements. i view it as a much needed equalization of a cost burden. I think we have further to go before it's completely equal. Fri, Jan 20, 2012 : 12:59 a.m.
Let's face it. What we have been doing for decades hasn't been working, so it looks like we have nothing to lose by trying Snyder's plan. I'm all for it! For the folks so opposed to EFM's I ask, where's the money going to come from? You complain that it is unconstitutional and undemocratic but Washtenaw county just refused to obey state law enacted by elected officials because they don't agree with the law. How undemocratic is that? Self service democracy doesn't work well. Maybe taxpayers should just stop paying taxes if we don't agree with how the money is spent. Thu, Jan 19, 2012 : 11:39 p.m. Thanks Ryan for the article. As you know, I don't agree with Gov. Snyder's view but, the other side as a fair right to have their opinions on Public Act #4 make light in the media! Thu, Jan 19, 2012 : 9:42 p.m. I think it is silly that anyone opposes this law. It is a huge benefit to cities that are suffering fiscal problems while they have no power to act. Here is an example of what happens when a city goes bankrupt: <a href="http://www.nytimes.com/2010/12/23/business/23prichard.html?_r=1&src=twrhp" rel='nofollow'>http://www.nytimes.com/2010/12/23/business/23prichard.html?_r=1&amp;src=twrhp</a> In this case the city has filed for bankruptcy twice and been turned down. You think these pensioners would have criticized an EFM back in 2009? But the alternative, bankruptcy is great, huh? How about Vallejo, CA? You think the cost of bankruptcy alone is better than an EM? Only $9.5 million in bankruptcy legal fees! What a bargain over bankruptcy! <a href="http://www.bloomberg.com/news/2010-12-14/vallejo-s-california-bankruptcy-failure-scares-cities-into-cost-cutting.html" rel='nofollow'>http://www.bloomberg.com/news/2010-12-14/vallejo-s-california-bankruptcy-failure-scares-cities-into-cost-cutting.html</a> A city in Rhode Island had to go bankrupt: <a href="http://finance.yahoo.com/news/Cashstrapped-RI-city-files-apf-1809896377.html?x=0" rel='nofollow'>http://finance.yahoo.com/news/Cashstrapped-RI-city-files-apf-1809896377.html?x=0</a> And then there is Illinois, where income taxes were raised 67% in addition to increased corporate taxes to fight their budget woes. Oops! That did not quite work.... <a href="http://chicago.cbslocal.com/2012/01/19/topinka-illinois-unpaid-bill-crisis-just-keeps-getting-worse/" rel='nofollow'>http://chicago.cbslocal.com/2012/01/19/topinka-illinois-unpaid-bill-crisis-just-keeps-getting-worse/</a> So it is obvious Michigan should just ignore any financial problems until it gets much worse. Thu, Jan 19, 2012 : 8:02 p.m.
........... the beginnings of the Peoples Republic of Michigan. Thu, Jan 19, 2012 : 10:29 p.m. So am I, PickFordDick. I am waiting for the Court and US Attorney General to issue their rulings! Until then you nut jobs can keep on ranting away and declaring your People's Republics. LoL. Thu, Jan 19, 2012 : 9:35 p.m.
Thu, Jan 19, 2012 : 8:11 p.m.
ROFL .... you people are unbelievable. Thu, Jan 19, 2012 : 6:03 p.m.
Thu, Jan 19, 2012 : 7:49 p.m.
Thu, Jan 19, 2012 : 5:26 p.m.
i'm not a fan of placing subjects in the middle of the photo... but that's a great photo of Snyder. Angela has quite a few great shots from the speech. nicely done! This is a stupid debate. It's in the Federal Courts hands now, as well as being reviewed by the US Attorney General at the request of the Michigan Congressional Delegation. Courts will determine the constitutionality of this &quot;law&quot; and whether it is legal to disenfranchise, whether it is is legal to void contracts, etc. At that point, we will know who is right and who is on the losing side of the debate. Until then, it's just meaningless finger pointing. LOL. Just because some union thugs filed a lawsuit doesn't mean it has any merit. We'll see who is laughing when the COURT rules. If there weren't constitutional questions, the courts wouldn't be involved, the US Attorney General wouldn't be involved, etc. Laugh away. Thu, Jan 19, 2012 : 9:27 p.m.
State law requires local government balance their budgets. Is that unconstitutional too Sparty? I think that if the state passes a law to make sure cities comply with existing state law, that should be allowed. Sorry, but just because you don't like it doesn't make it illegal. Your theory that the legislature can authorize the judiciary to void contracts (bankruptcy judges) but not the executive (emergency managers) is bizarre. And I'm not angry watching a bunch of liberals mayors and city councils lose their power or get kicked out of office, it actually makes me LOL! Thu, Jan 19, 2012 : 8:10 p.m.
Not legally .... we will see what the Courts say. Quit the angry replies til then. Thu, Jan 19, 2012 : 5:52 p.m.
More lies. The governor of Illinois has previously voided union contracts, for one. Not by a Governor, it hasn't .... only a Court of Law has the power to void a contract to-date. We'll see what the Courts rule, Angry Moderate. Your name is fitting, by the way. Thu, Jan 19, 2012 : 4:08 p.m.
Courts don't need to determine whether contracts can be voided, that's been settled for about a hundred years. Thu, Jan 19, 2012 : 3:50 p.m.
Face it people......Detroit is going down....the EFM is the only hope they have and I do not believe that will be enough to help those that do not want to help themselves.....time will tell. @ Hank We voted for Snyder. Democracy is working! Nuff said! I see. It wasn't worthy of attention when Granholm did it, but now that union contracts are on the table, it's racist, unconstitutional, undemocratic, and the sky is falling. Thu, Jan 19, 2012 : 5:11 p.m.
@ Angry Moderate - Yes, it was a problem under Granholm too. It's just recently gotten shoved in the spotlight. Thu, Jan 19, 2012 : 3:28 p.m.
Forever27, did you vote for the EFMs that were appointed under Granholm? Or did this just become a problem since you lost an election? Thu, Jan 19, 2012 : 3:25 p.m.
we didn't vote for any EFM's that doesn't seem like a functioning democracy to me. The EMs are not here to torture or in some way abuse the citizens or the leaders of a given city. Instead, they are there to offer assistance and cut cost to (hopefully) give these struggling municipalities a chance to turn things around. Does it feel a bit big brother intervention? Yes, but what other alternatives are there? Thu, Jan 19, 2012 : 5:19 p.m.
Forever27 since when is a balanced budget a conservative thing? Thu, Jan 19, 2012 : 3:24 p.m.
funny how it's ok for big brother interventionism when it comes to conservative agendas, but when we want to fund our schools or actually tax businesses, it's evil socialism. Thu, Jan 19, 2012 : 9:14 p.m.
My vote won't be stripped because I don't vote for corrupt, incompetent idiots that break the law by refusing to balance the budget. &quot;Your vote&quot; is being &quot;stripped&quot; because of the financial decisions of those in office. You cannot separate the two. They do not send EMF's to cities who are not in a financial emergency. Thu, Jan 19, 2012 : 3:05 p.m.
One last time,I'm talking about being stripped of your vote not how to fiance the cities falling into problems. Tell me what you think of the vote nullifying issue? Thu, Jan 19, 2012 : 2:45 p.m.
My post today didn't have anything to do with fiances. Read what i said,it has everything to do with voting and democracy. Thu, Jan 19, 2012 : 2:38 p.m.
Hey conservatives I'm waiting for someone to explain to me how rendering your vote null ,while the emf is in control not an assault on democracy. What no talking points to explain this away ? Thu, Jan 19, 2012 : 9:03 p.m.
What the people who claim this is an attack on democracy do not understand is the the power of cities to govern comes from the state. The state can take that away too. And since the state funds local govts, the state has every right to make sure tax money is appropriately spent. Forever27 refusing to balance your budget is not leadership! Thu, Jan 19, 2012 : 3:30 p.m. Yes, and we voted for the representatives who passed this law. Cities are created by state law. State law can organize them as it pleases. Thu, Jan 19, 2012 : 3:23 p.m.
@angry moderate, there is a democratic right to representative leadership. Thu, Jan 19, 2012 : 2:55 p.m.
Because there is no democratic right to violate state law by refusing to balance your budget. Thu, Jan 19, 2012 : 2:35 p.m. I think the Governor has the right idea and would challenge someone to come up with a better idea. All I hear from the left is complaining and nothing constructive. Face it people, something has to be done soon. Forever proves your point Pick. Not only no other idea, but a silly claim that democracy is being suspended with no support for that either. This law has nothing to do with democracy. it's not just the Left that has a problem with the suspension of democracy. But we can go ahead and make the fact that one person is in control of entire cities. Thu, Jan 19, 2012 : 2:12 p.m. I can not seem to understand why the Democratic party and their liberal views have a problem with EFM. I think we need to rename them the party of Entitlements. Thu, Jan 19, 2012 : 8:47 p.m. Pick, he never posts an alternative. My guess is he prefers a bailout or significant raises in taxes to fund exorbitant spending. Or perhaps its just &quot;let nature take its course,&quot; let a city become a deserted wasteland. Problem is, if he put his solution in his comments, he would be dismissed even more. I think that if Mayor Bernero had won the election and done the very same thing, he would be exhilarated. Some people based on their politics don't look at what is being done, but who did it, who gets the credit. Unions do this all the time. They complain and fight but never offer any solution to funding problems. Thu, Jan 19, 2012 : 5:06 p.m.
Thu, Jan 19, 2012 : 2:36 p.m.
Come on hank....tell us how you would solve the problem. Thu, Jan 19, 2012 : 2:34 p.m.
We need to rename the republicans the party shameless greed. Thu, Jan 19, 2012 : 1:39 p.m. When we hear that a number of our school system are under financial distress thus the need for an Emergency Manager, I can only think of our trillions in national debt. Does this mean that eventually the country itself could come under an Emergency Manager? I maintain that this a test run for &quot;Emergency Governors.&quot; One step at a time. @mike, difficult decisions like being willing to pay for things like public education, roads, fire stations, etc. that is the hard truth that people are refusing to admit. The US pays one of the lowest rates in taxes (not to even touch on the issue of the inequity of that distribution), yet we complain that our government can't handle funds because we require more from them than we're willing to pay. Thu, Jan 19, 2012 : 2:23 p.m.
Thu, Jan 19, 2012 : 1:34 p.m.
Wake up, people! The truth hurts. In the real world, when you don't manage your money efficiently, you have less control of what happens in your future. Snyder's right. Adknowledge it, and get to work to change the future instead of crying about the consequences of poor choices. Thu, Jan 19, 2012 : 8:35 p.m.
forever27 Please check out Bell City, Ca. where the mayor, city manager and city counciling were arrested and charged by the California Attorney General with bilking the city out of 5.5 million in salaries. &quot;It's always a right to have a representative form of leadership&quot;? I think not. Thu, Jan 19, 2012 : 5:56 p.m.
@ Forever 27 - you're right - we do have representation - Snyder is representing us. @ThaKillaBee - umm, we barely became a democracy; it almost didn't happen. Look it up. Yes, once democracy is establishes and respected, it works and it can be very powerful. If you don't respect it, you tear away at it's foundation, and there is nothing left. Being responsible is part of upholding what democracy is. Yes, it supports the notion that some aren't responsible, but if everyone acted irresponsibly, we wouldn't have a democracy anymore. Democracy is built on the foundation of personal responsibility. We'ver already allowed Detroit to exercise their abilities, and they just don't have what it takes to turn it around. If we let things persist they will stay this way for another 50 years and be a drag on the state. Snyder knows that Michigan just can't afford to let Detroit be irresponsible anymore. The &quot;status quo&quot; leadership previous to Snyder is what is sinking the city. Most people are tired of it. If Detroit could take care of themselves, we wouldn't be in this situation. There is no democracy when a bankruptcy judge unilaterally cancels contracts. Why don't you complain about that? Thu, Jan 19, 2012 : 5:02 p.m.
@ Visha - yes, but I'm choosing to bring the debt consolidation service in. With Snyder, he's coming no matter what. @rainy - Democracies aren't fragile unless the people running them don't understand what the concept means. Democracies, as we have seen in our own history, are very powerful things--the opposite of fragile. Your idea that rights have to be earned is just so completely out-of-touch with what &quot;rights&quot; mean. The idea that democracy itself is the problem with democracy is scary. Circular logic based on a superior &quot;we know what's best&quot; attitude. I'd rather have a city sink into Hell because of the majority vote than have a dictator move in, on principal alone. Thu, Jan 19, 2012 : 4:54 p.m.
&quot;Someone doesn't intervene and re-create my budget based on what they think I should be doing.&quot; But you could happily accept help from a debt counseling agency before bankruptcy in an attempt to not lose your house. rainy, it is ALWAYS a right to have a representative form of leadership in this country. Thu, Jan 19, 2012 : 3:54 p.m.
@ Forever27 - I did say &quot;oftentimes&quot;, not &quot;always&quot;. It isn't a right to be able to mismanage a city/country and not have to be accountable for it. @rainy, tell me where in our founding documents does it say that rights are earned. From what I understand about the enlightenment period, it was about the INALIENABLE RIGHTS OF MAN. That has nothing to do with earning them. @ThaKillaBee - Democracies are fragile things . . . people spout off about rights and don't realize that they are oftentimes &quot;earned&quot;. Cities are managed slightly differently than homes - you can't just move the city if you don't make the payments. Good people suffer because of the poor management of elected officials (lack of police, ambulance, street lights - these things cost money). In the real world, bankrupt cities are dangerous places that don't support healthy living. You can't just walk away or say that it's &quot;democracy&quot; and we should let the city fall in disrepair and its people to live in anarchy and chaos because of local management's poor choices. We're all connected. Michigan has suffered long enough because of Detroit. This is about accountability. Thu, Jan 19, 2012 : 2:07 p.m. In the real word, we have a democracy. For better or worse, no one person can decide whether or not the majority of people made the wrong choice. In the real world, when I don't manage my money correctly, I go bankrupt and lose my home. Someone doesn't intervene and re-create my budget based on what they think I should be doing. Thu, Jan 19, 2012 : 1:18 p.m.
For all of you just tickled pink over the emf law remember, it is an assault on democracy. If your vote for an elected official has been rendered null and void when a efm manager takes over then explain to me how it can't be. So many conservatives wave the flag of freedom but they do so without any true conviction. Regardless of the consequences of making poor voting choices I'll take democracy over a dictatorship. Thu, Jan 19, 2012 : 2:21 p.m.
Thu, Jan 19, 2012 : 2:14 p.m. Please tell us hank.......how to you purpose to solve the problem with Detroit? We are waiting hank. Thu, Jan 19, 2012 : 2:06 p.m.
Snoopdog - can you name one Emergency Manager that has left their position? Thu, Jan 19, 2012 : 2:02 p.m.
Thu, Jan 19, 2012 : 1:38 p.m.
You know Hank, if I were to vote for someone who turned out to be clueless and was doing my city harm, I would welcome the state to come in and stop the damage. The only way I would have a problem with this is if the state sent in somebody like kwame kilpatrick. Thu, Jan 19, 2012 : 1:15 p.m.
&quot;A number of our cities and schools are suffering major financial distress,&quot; says the Governor. Only fools and the naive don't understand why this is so. If you rob money from schools, local municipalities, and the elderly, in order to put a little lipstick on the vast business parks long ago vacated by wealthy profiteers . . . everyone but the well-off will eventually be destitute. Thu, Jan 19, 2012 : 8:51 p.m.
glacialerratic - if you're so concerned about Flint voters being disenfranchised, direct your complaints at Granholm. She's the one that gave them an emergency manager. And I assume that you live in Flint, right? It would hugely hypocritical for you to blame white flight for the city's problems and accuse the state of abandoning them by moving out, if you actually live in a lily-white suburb yourself. Thu, Jan 19, 2012 : 4:11 p.m.
You are wrong to attribute Flint's situation to a an ill-defined dysfunctionality. Flint's problems are the result of decades of economic decline, public neglect, and political opportunism. To now lay responsibility at the feet of its residents and to disenfranchise them ignores how this disaster has come about. Flint's slow decline from prosperity began in the 1960s with disinvestment by GM, relocation of manufacturing, and white flight--deindustrialization and decline accelerated in following decades. Moreover, a century of urban prosperity in US northern manufacturing centers masked the weakness of these cities, and the unstable relations among worker neighborhoods often bitterly divided by race and ethnicity. Politicians, right and left, fed--and continue to feed--on these tensions. Gingerich's recent comments about food stamps is merely the latest in decades of racially-charged assertions. The decline of Flint led to the exodus of those who could afford it, financially and socially. The city's black population had the fewest choices. Flint was abandoned by Michigan years ago. This should afflict all our consciences. Except that Flint and Benton Harbor have been completely dysfunctional for decades, no matter who is in office or how good the economy is. Thu, Jan 19, 2012 : 12:29 p.m. Handle your business and you have no worries. Really not that hard to figure out. Thu, Jan 19, 2012 : 7:06 p.m.
@ThaKillaBee - it doesn't take a rocket scientist to figure out that Detroit has major problems. Ask the majority of the people in Michigan and around the U.S. if they would like to live in Detroit, and there's your answer. Snyder isn't going to ignore one of the worst problems of the state. Detroit has a history of violence, dirty politics and all manner of mismanagement. The fact that they can't balance the budget is the icing on the cake. They need help to make better decisions. They need babysitting until they understand how to improve their own situation. I'm glad someone's finally doing something. @bee - that's like saying if you don't pay your mortgage then it's the banks fault?? Thu, Jan 19, 2012 : 2:05 p.m. This is kind of like saying &quot;don't break the law and you won't ever be bothered by police.&quot; Whether or not you're correctly handing your business, in this sense, is completely up to the Governer. Thu, Jan 19, 2012 : 11:45 a.m.
Thu, Jan 19, 2012 : 3:18 p.m.
@stephen, while Ann Arbor's government can make decisions that are frustrating and annoying, they are far from &quot;destroying our city.&quot; I'm one of the first to voice my disagreements with the city. However, as a city, Ann Arbor has done a hell of a job staying ahead of an economic collapse that has done irreparable damage to our entire country. Lets give credit where it's due and stay away from hyperbole. Thu, Jan 19, 2012 : 2:01 p.m.
&quot;Why people would continue to elect officials that destroy their communities.&quot; Look at Ann Arbor. Thu, Jan 19, 2012 : 11:31 a.m.
Those that don't like the EM, would you prefer a brankruptcy judge making your city's decisions..? Thu, Jan 19, 2012 : 6:40 p.m.
Ok - Here is the impact of bankruptcy on a city: 1) end of pensions and medical benefits for retirees 2) the ability to sell any and all assets of the city 3) the end of any and all union contracts 4) the termination of any and all employees 5) forced merger of the community or district into another one 6) increase in bond costs not only for the government unit in question but all others in the state 7) outsourcing/privatization of any and all services 8) termination of any and all services 9) redirection of tax income to parties that are owed money for a term to be determined by the judge. The EM does not have anywhere near these powers or the impact on the rest of the state. Wake up. No, it's not &quot;bending the rules.&quot; It's exactly what the rule says they can do. And it's non unilateral-- it involves a commission with 8 members, the governor, and a judge double-checking their decisions. A bankruptcy judge, on the other hand, can void contracts unilaterally. @mike, unilaterally removing elected officials doesn't count as bending the rules? Thu, Jan 19, 2012 : 2:18 p.m.
Thu, Jan 19, 2012 : 2:04 p.m.
Thu, Jan 19, 2012 : 1:20 p.m.
Thu, Jan 19, 2012 : 11:26 a.m. So does Ann Arbor's Mayor and Ann Arbor's arrogant Country Commissioner Conan Smith. It's gutting the democratic elective process. Snyder knows it and so do Ann Arbor's 'democrats'. Thu, Jan 19, 2012 : 12:33 p.m.
Alan could you explain your thought process on this, I'm very confused over how ANYONE cant get behind this.